Wood for the work was stolen from the trees outside the bedroom windows of the childhood home of Charles Lindbergh in Little Falls, MN. Installation view at the Americana exhibit at the Soap Factory, curated by Ben Heywood. A podcast about the work can be heard here. "Five years ago Minnesota artist Kenneth Steinbach stole some lumber from the grounds of Charles Lindbergh’s house and museum in Little Falls, Northern Minnesota. From this found material he whittled 2600 pencils: the meticulously fabricated individual art objects that make up The Machine in the Ghost. The Machine in the Ghost is a memento mori to individual action. Each carving, stemming from an impulsive acquisition, is a distinct action of the artist, and each horizontal penetration could symbolize the result of a separate and equal decision to take control of our own destiny. 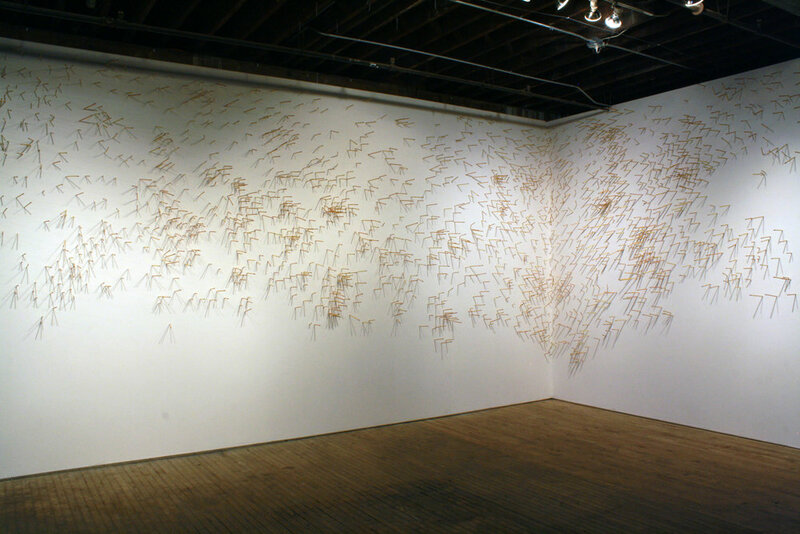 Each pencil is thrust into the wall, as we might have done with our own school pencils in a futile and childish attempt to kill time, to make our own mark, to take control of writing our own story. Lindbergh could see this as celebration of the primacy of the individual over the group. But The Machine in the Ghost is a dying fall; what we see here is not real, the pencils are merely carvings, and what we understand is that all of our actions, however defining, mock-heroic, singular or self-satisfying, are only what they are; pencils stuck in the wall."